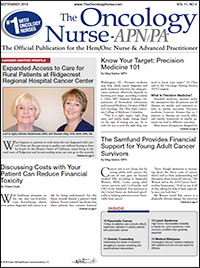 The September issue of The Oncology Nurse-APN/PA (TON) is filled with important news and updates for oncology nurses. This issue’s coverage includes an enlightening interview with Shantell Utley, OCN, MS, BSN, RN, Clinical Project Manager, Oncology Services and Outpatient Pavilion, Ridgecrest Regional Hospital (RRH), who explains how a partnership between her institution and the University of California (UC) Davis is providing access to unprecedented cancer care services to a segment of California’s rural population (learn more). “Using advanced technology, the RRH oncology team can transfer pathology slides and reap the benefits of support and insights from expert oncologists at UC Davis and its 5 affiliated rural-based cancer treatment centers,” said Ms Utley. Other valuable information you will find in this issue includes strategies for facilitating discussions with patients about the cost of cancer care, which has been shown to reduce financial toxicity and improve outcomes (learn more); the importance of incorporating the patient’s voice during treatment (learn more); and the benefits associated with increased adherence to exercise and nutrition guidelines among cancer survivors (learn more). 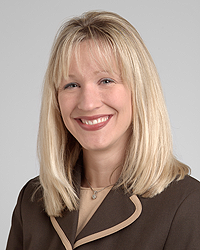 “Emerging data do suggest that people who follow these guidelines have longer survival,” said Erin Van Blari­gan, ScD, Assistant Professor, Departments of Epidemiology & Biostatistics and Urology, UC, San Francisco. In addition, cost and access to genetic testing are explored in an informative article by Lisa Schlager, Vice President, Community Affairs, FORCE: Facing Our Risk of Cancer Empowered, Tampa, FL, and Cristi Radford, MS, CGC (learn more). Ms Schlager and Ms Radford describe some of the loopholes faced by individuals who are in at-risk groups for a particular type of cancer (known as previvors), but for whom guidelines do not recommend often necessary or life-saving testing and screenings until a certain age. They also emphasize the importance of not overlooking the burdens faced by previvors and finding ways to better ensure that these patients have affordable access to all of the services they need. We also delve into the “hot topic” of physicians’ attitudes regarding the use of medical marijuana. According to the results of a recent survey, although oncologists often discuss the potential benefits of marijuana with their patients, many admit that their knowledge level about its efficacy is insufficient, primarily because the medical evidence is anecdotal only (learn more). This issue of TON also includes key presentations and studies from recent national meetings, including the Oncology Nursing Society 2018 Congress, the 2018 Cancer Survivorship Symposium, and the 2018 American Society of Clinical Oncology meeting. As always, we hope you will enjoy this issue of TON, and look forward to receiving your feedback. You can contact us via e-mail at info@TheOncologyNurse.com.